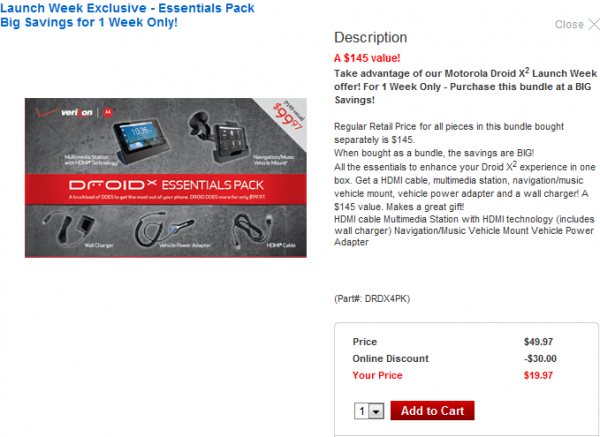 DROIDX and DROIDX2 “Essentials” Bundle Only $19.97 at Verizon, Steal of the Century? DROIDX and DROIDX2 owners, you may want to pay close attention. Verizon is offering a “Launch Week” exclusive accessory bundle that includes a HDMI multimedia dock, car mount, wall charger, HDMI cable, and car charger for less than $20. If you bought this stuff individually it would cost you about $145, so as you can see, is the steal of the accessory century. *Note – In order to get this deal, you may have to sign out of your account and buy it that way. Click the “Buy” link below. Click “Shop By Another Device” on top right of page. Checkout: Total should be $19.97. 5. And it should show up. Add it to your cart.